Opening night of Carols 2011 is now a part of history. It was a great evening of fellowship and worship. The Sanctuary was full. The congregation was involved and engaged. It began and ended with WORSHIP – “O Come O Come Emmanuel” to “Amazing Grace”. Lavon, in his closing remarks tonight, reminded us all that the Manager without the Cross is meaningless. Salvation requires both. To me that brings the cost of our salvation even more into focus. John 3:16 sums it up – “For God so loved the world that He sent His only begotten Son, that whosoever believes in Him will not perish will have everlasting life.” The Gospel is summed up in one simple verse. Jesus came so we would not have to pay the price of our own sins. Talk about amazing grace! 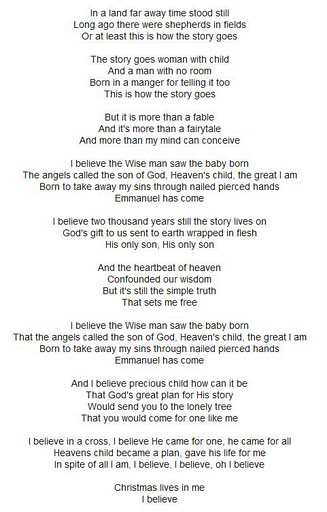 During Carols, the song “I Believe” brings the prophecy and its fulfillment through Jesus’ birth, all together. It is a great song (sung for us by Sarah Lee!) top to bottom but this verse invades my heart and mind each time I hear it. It was God’s plan from the beginning. He came for one – me – He came for all – the world that includes even me. My prayer tonight is that there were some in that room tonight that made that connection and concluded, too, that they also believe. Emmanuel. God with us. I believe.